NewGlass2 is a scientifically formulated "fiberglass restoration" product. NewGlass2 provides a hard, shiny coat of protection for your fiberglass gel coat. Restores color and shine. Excellent protection from sun and sea. Easy to apply and long-lasting. Never wax and buff again. 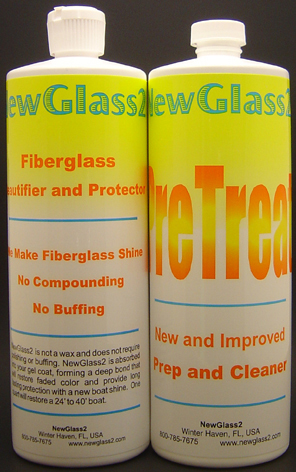 PreTreat is an excellent cleaner for fiberglass. Removes grease, wax, dirt and prior coatings of products like Newglass2. Can be diluted with up to 3 parts of water. StainRemover is not a cleanser. It is a stain remover meant to be used on brown water and rust stains. It is delivered in a dry format and water needs to be added. StainRemover is a bleach that works on fiberglass as well as wood and concrete. Our applicators are made of artificial chamois wrapped around a non-absorbent foam core for easy handling. Two (2) applicators included at this price of $5.95. 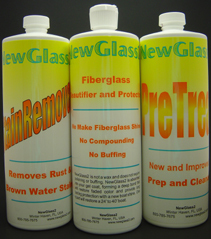 NewGlass2 kits consist of 1 quart of NewGlass2, 1 quart of PreTreat and an optional quart of StainRemover. Appropriate applicators and scrubbers are included.